Copyright version 1920, sheet bronze. Smithsonian Art Inventory Control Number: 71500556. On northwest corner of Alfalfa County Courthouse lawn at 300 South Grand Avenue. The engravings on the upper middle base are emblems of four of the services. The two side stones contain engravings of land, air and sea scenes. The original dedication date has not been determined, but based on the copyright mark information and memories of Ramona Herren, a retired long-time local teacher, it must have been in the 1927-1930 range. The local American Legion post was instrumental in the acquisition of the Doughboy, which originally stood on the southwest corner of the courthouse lawn. Its base contained a list of the county’s war dead and a Spanish American War cannon was on the part of the lawn where the Doughboy now stands. The original base deteriorated and the cannon was donated to a World War II scrap drive. of the Cherokee Public Library. The Doughboy was moved to its current location when water lines around the courthouse were rerouted after World War II. At some point many years ago, the left hand and rifle were broken off, but they were kept in storage in the courthouse. The photo at left, from the Cherokee Messenger & Republic shows the Doughboy before it was cleaned and restored. 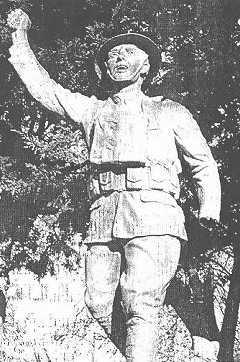 In the Spring of 2002, with County Assessor Sonya Booher leading the activities, the Doughboy and its base were cleaned and restored by Jensen Conservation Services of Omaha, Nebraska, and the hand and rifle were replaced (the sling wasn't included). Funds for the project were raised by public subscription and a grant from Save Outdoor Sculpture. The monument was rededicated November 11, 2002 in a program that gave recognition, by name, to the 21 servicemen whose names had been listed on the original base. Above: The cover and order of procedure page for the November 11, 2002 re-dedication of the Cherokee Doughboy. Without knowing this event was scheduled, Viquesney Doughboy researcher Earl Goldsmith arrived in Cherokee around noon that day to obtain photos of the newly restored Doughboy. While there, he saw the stands that had been erected for the service, went into the courthouse, and met Sanya Booher, Alfalfa County Assessor, who had headed the restoration project, and her able assistant. They were very gracious in showing him around the courthouse area, in discussing their memories of the Doughboy, and the restoration by Jensen Conservation Services. Earl regrets that other commitments made it impossible for him to stay for the re-dedication ceremonies.